As expected following last month's tease, Codemasters has confirmed that a new Overlord game is in the works. 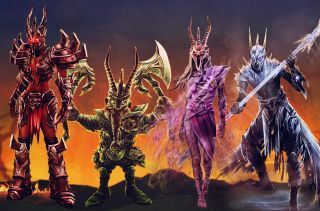 Unlike the previous releases, however, this one is all about the multiplayer, with up to four "Netherghuls" working together to return evil to a world overrun by goodness. You see, with the last Overlord dead and gone, the forces of good have had a pretty easy run of things. So the Minions set out to find a new leader, and—efficient as ever—they actually came up with four: the warrior Inferna, the necromancer Malady, the Dwarven rogue Hakon and the Dark Elf Prince Cryos. Any of them can be taken out to do bad in single-player mode, ably assisted by the dimwitted Minion horde, but the game's priority is clearly on semi-cooperative action, either locally or online, for up to four players at once. "We’ve been scheming about a new Overlord for some time," Executive Producer Rob Elser said. "We really wanted to do something that would allow us be evil alongside our friends, instead of the normal heroics in every other game. The idea of playing as a team of bad guys commanding Minions to do our utmost bidding, while also causing chaos for each other, just really made us smile. And as you know, an Overlord game never takes itself too seriously." The script is being written by Rhianna Pratchett, who also wrote the first two games in the series, so while the Lord of the Rings parody is a little obvious, there's a decent chance of some fresh laughs here. "Tone-wise OL:FoE is very much an OL game. Fits in with the established world and canon," she tweeted earlier today. She also left open the possibility of a full-on sequel, adding, "I do hope that there's a full Overlord III one day, but for now I am really happy to be working on something Overlordy again." Overlord: Fellowship of Evil is expected to come out later this year.